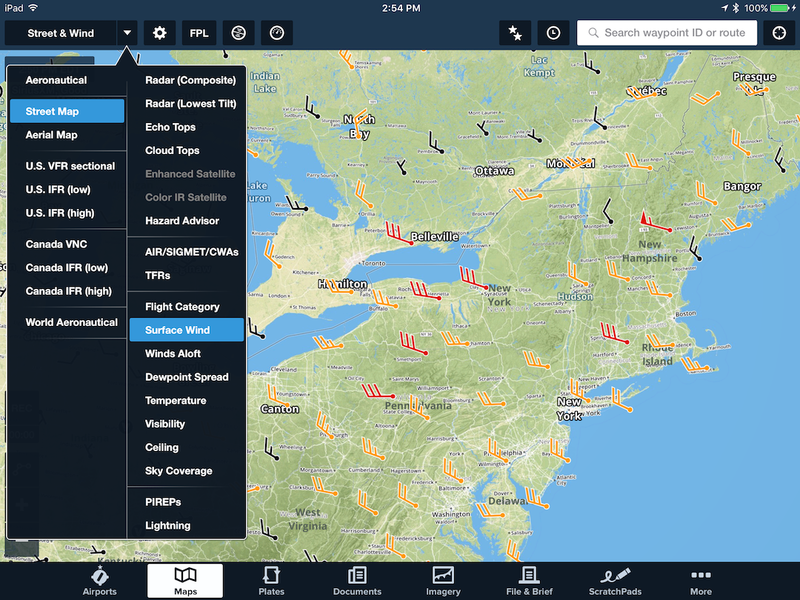 ForeFlight 7.7 introduces the ability to share Logbook draft entries with other pilots, as well as a new radar layer, a new rate of descent instrument, Stratus ESG support, and lots of work under the hood to improve general map performance. 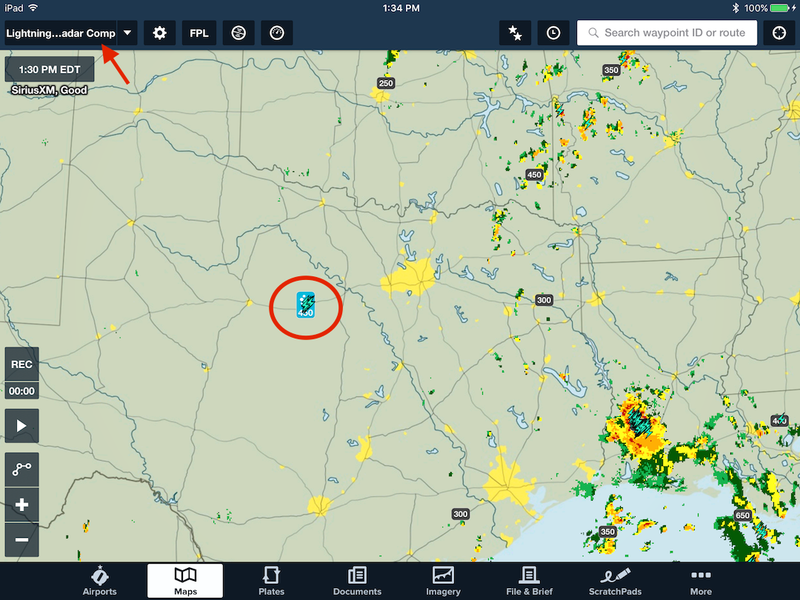 The new Flight Sharing feature in ForeFlight Logbook makes it easy for pilots to send and receive draft flight entries. 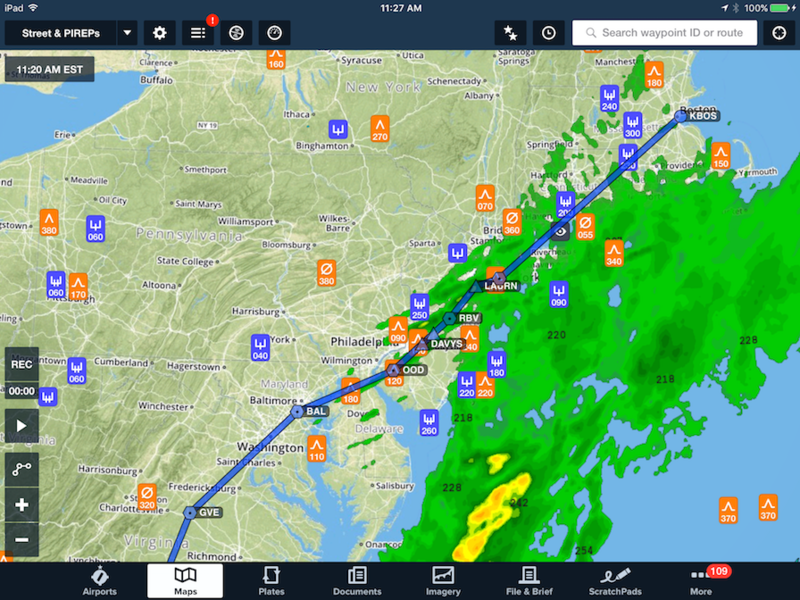 Pilots can share a flight with one or more people right from the ForeFlight app. The receiving party then modifies and accepts the entry into their own Logbook. 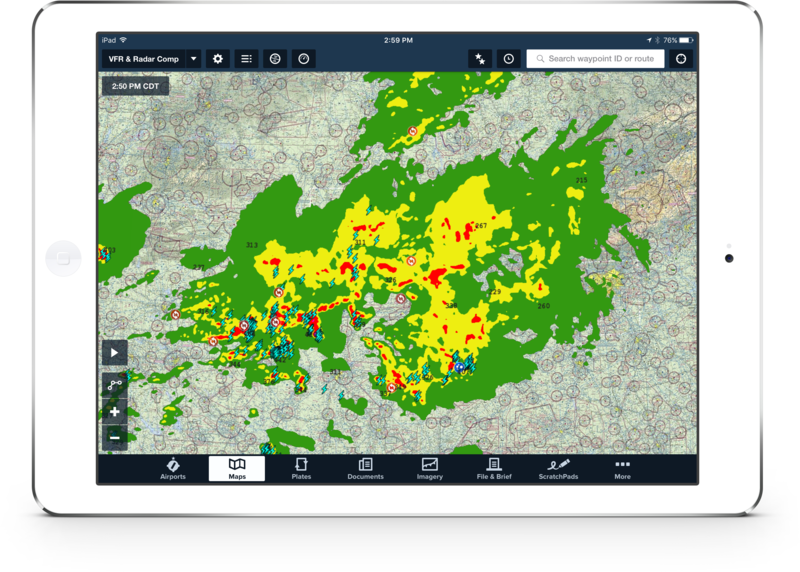 Flight Sharing makes it convenient when practicing approaches with a friend– use one iPad to collect the flight details, then simply share the entry. 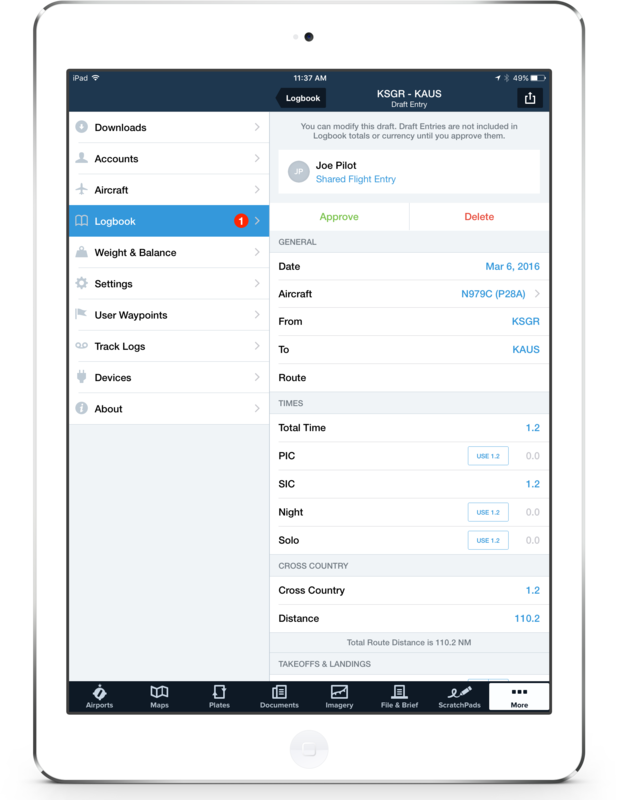 It is also a time-saver for corporate flight crews who can now share a logbook entry between the Captain and First Officer, reducing time spent on the administrative aspect of a flight. Shared entries are just like drafts from Track Logs – review and edit the information, then tap Approve to add it to your Logbook. Don’t let your medical expiration sneak up on you. 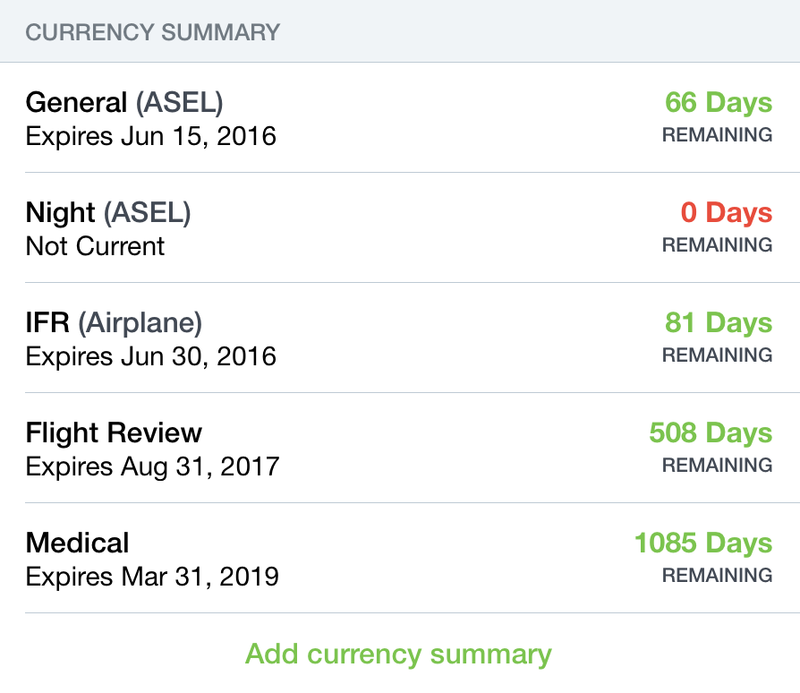 When you add your medical certificate to the Logbook Qualifications section, you can now also add it to your currency summary view. This keeps the time remaining until your medical certificate expires front and center. 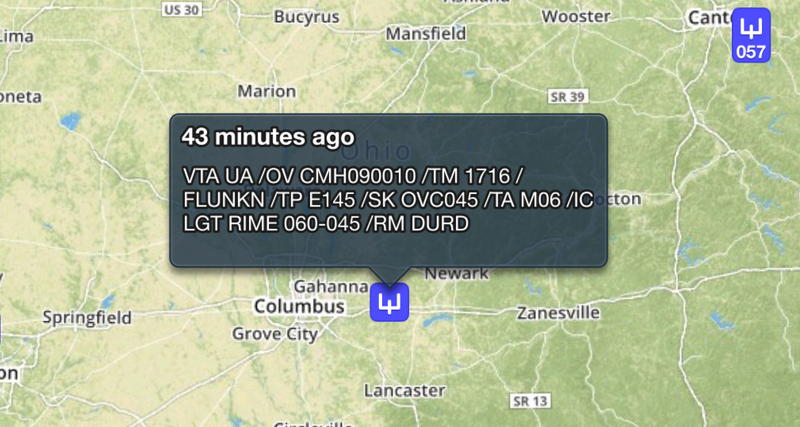 Bundled with ForeFlight 7.7 is a firmware upgrade for Stratus 1S and 2S receivers. 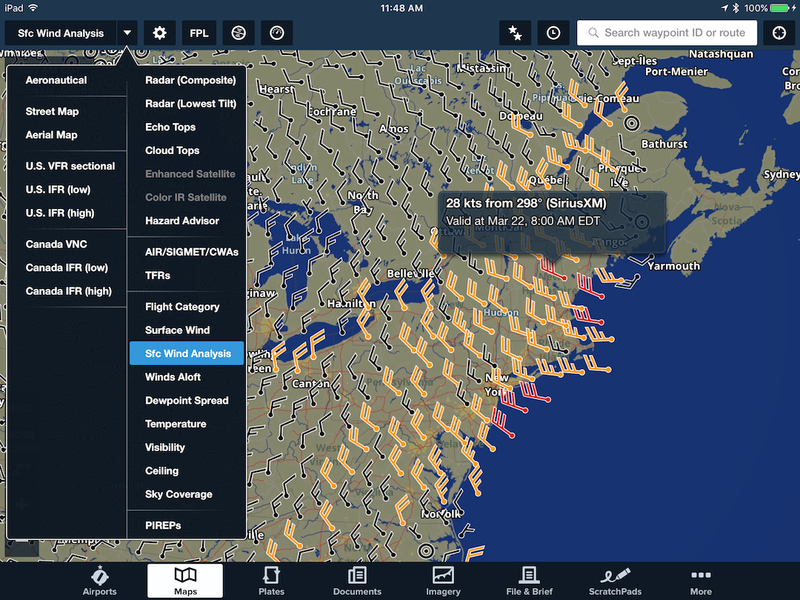 This upgrade adds support for the Stratus ESG, Appareo’s new all-in-one ADS-B Out solution. Stratus 1S and 2S devices can connect to the Stratus ESG via a USB cable to take advantage of its auxiliary power for continual charging, as well as the transponder’s externally mounted WAAS GPS and ADS-B receivers for maximum reception. The upgrade also adds new features to the Stratus 2S. 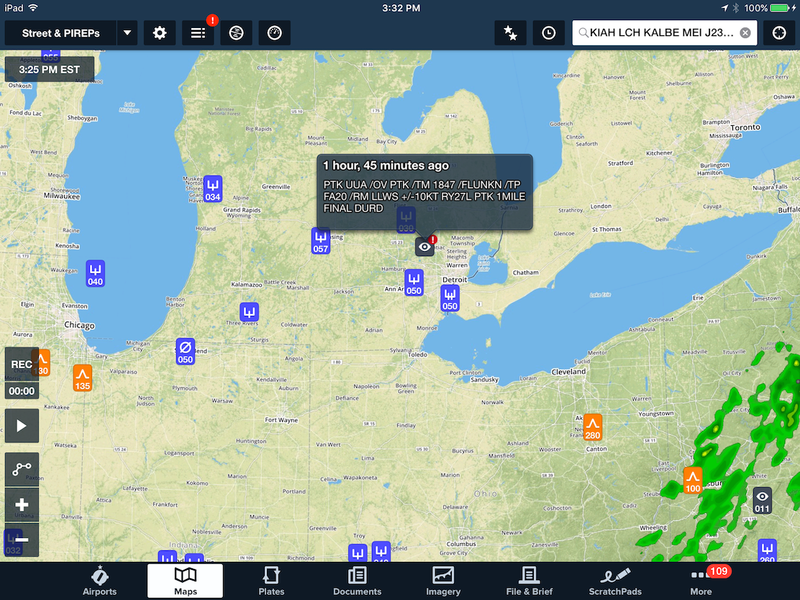 The built-in Flight Data Recorder now has automatic flight leg detection which automatically stops a Stratus Track Log and starts a new one when a full landing is detected. 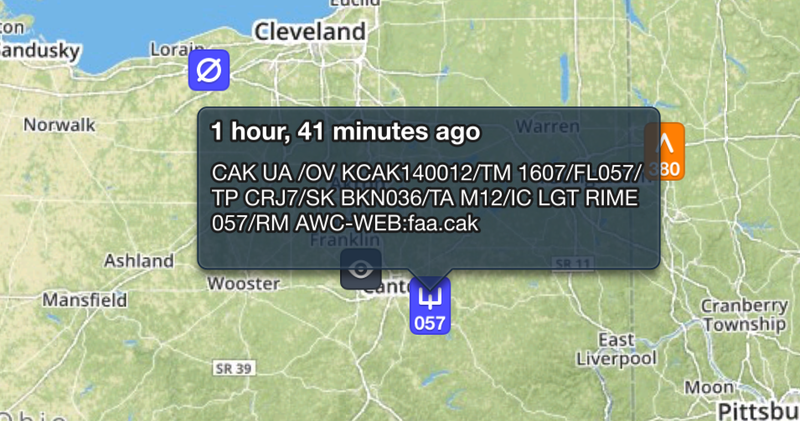 In addition, customers now have the option to save AHRS calibration settings between uses – this is especially helpful for taildragger aircraft pilots who set ‘straight and level’ attitude while inflight. 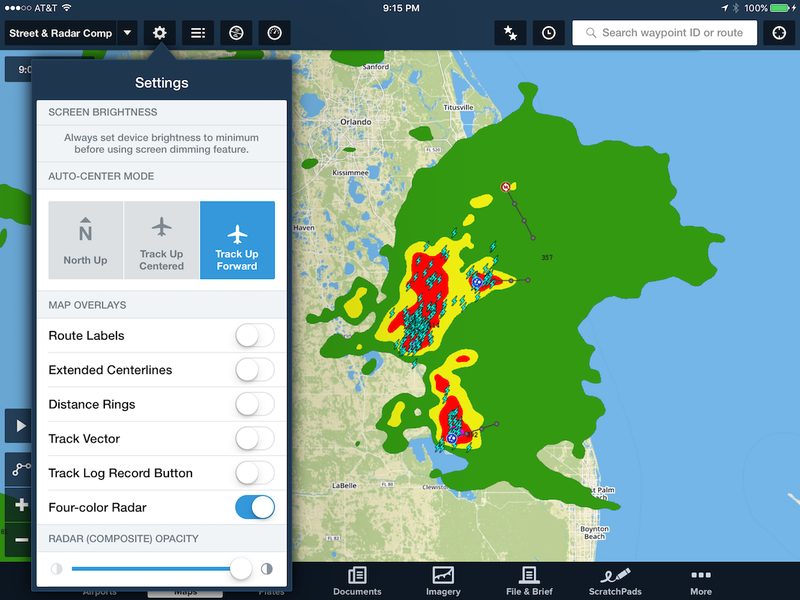 For more informed preflight planning, you can now choose between the existing NEXRAD composite reflectivity layer and a new NEXRAD base reflectivity from the lowest elevation angle, or Lowest Tilt, layer. 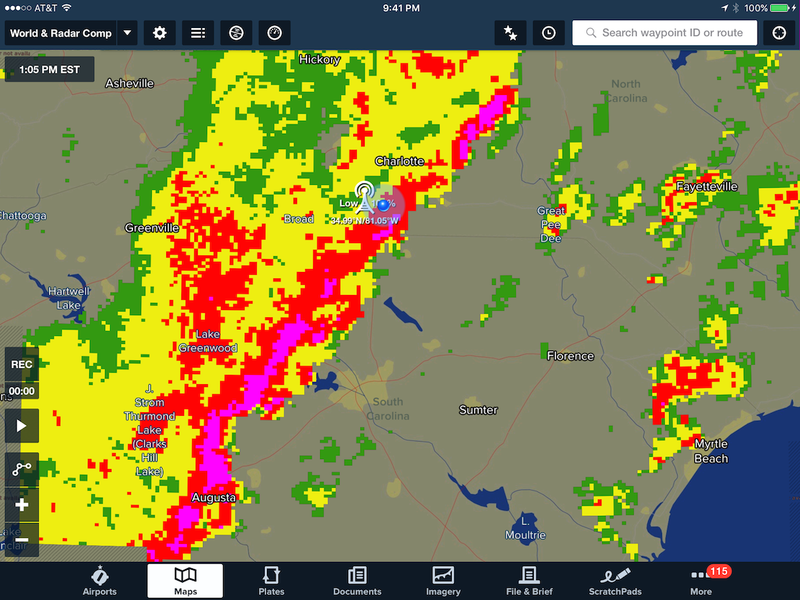 The current radar layer — renamed ‘Radar (Composite)’ — does what its name implies: it shows a composite view of multiple angles of radar scans. 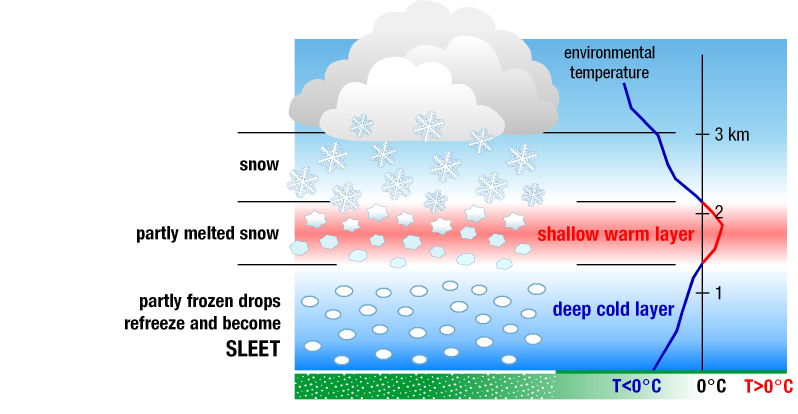 The new Radar (Lowest Tilt) layer shows only the lowest angle scan, generally providing a more accurate picture of where precipitation is actually reaching the ground. 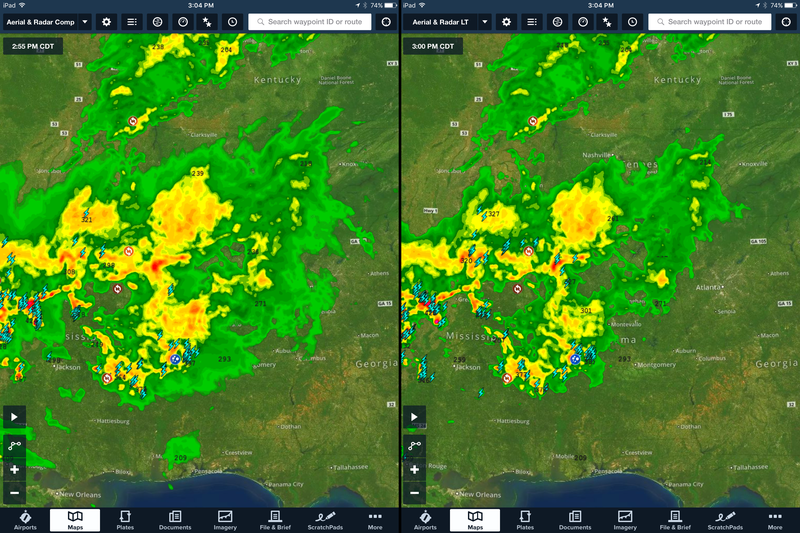 The composite radar image at left shows precipitation over Atlanta, but the lowest-tilt scan on the right reveals that precipitation is only reaching the ground well west of the city. 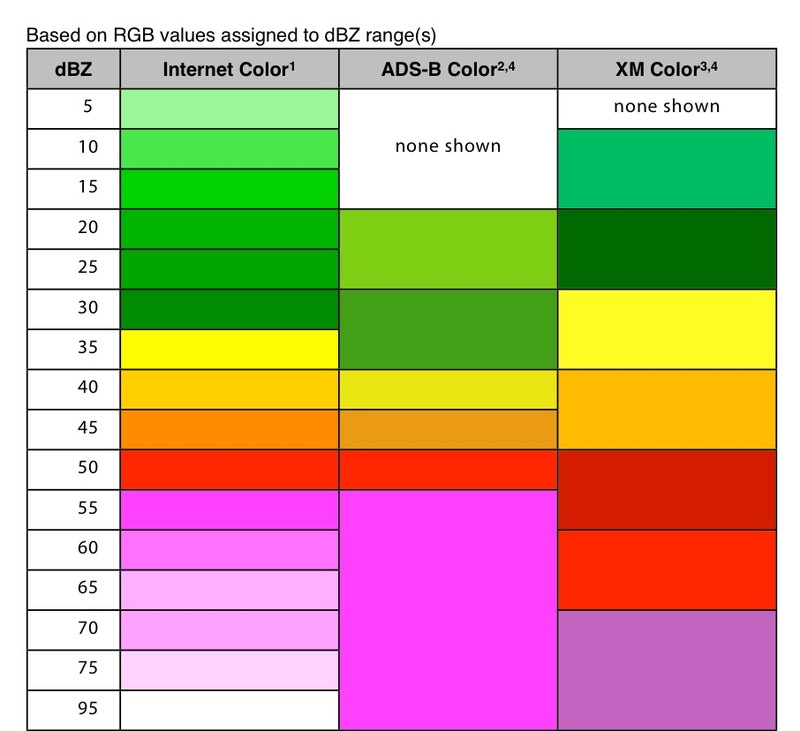 In addition, you can display either radar layer in the low resolution, 4-color scheme defined by the Radio Technical Commission for Aeronautics as the standard for airborne radar coloring. 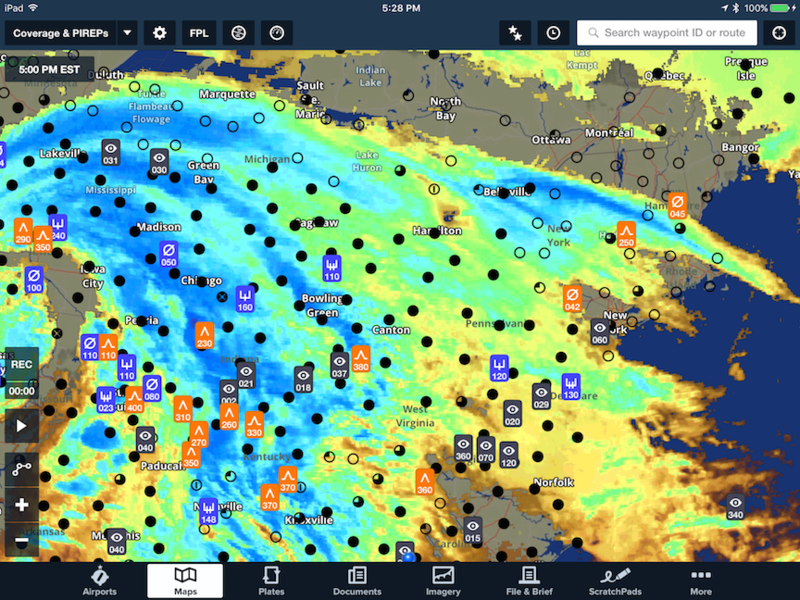 This option is available in the Map Settings menu as “Four-color Radar”. 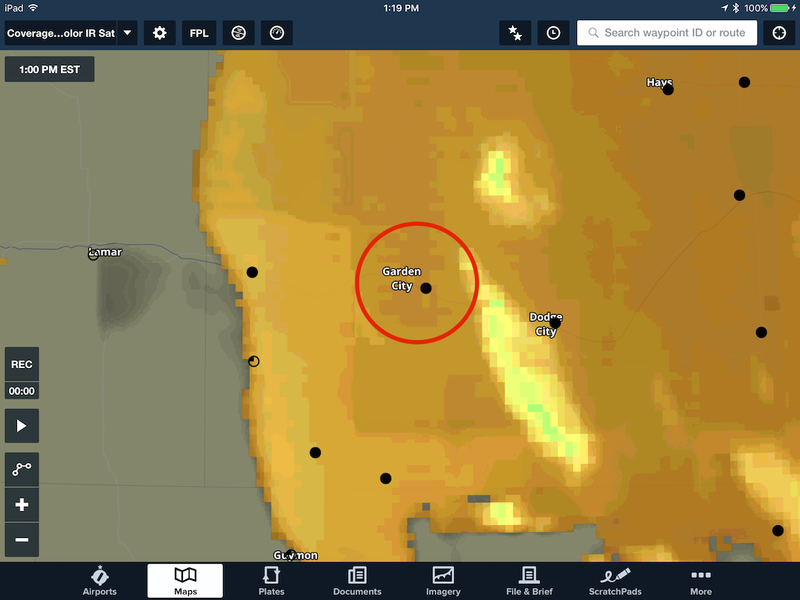 Check out Scott Dennstaedt’s blog post to learn more about these new radar features. 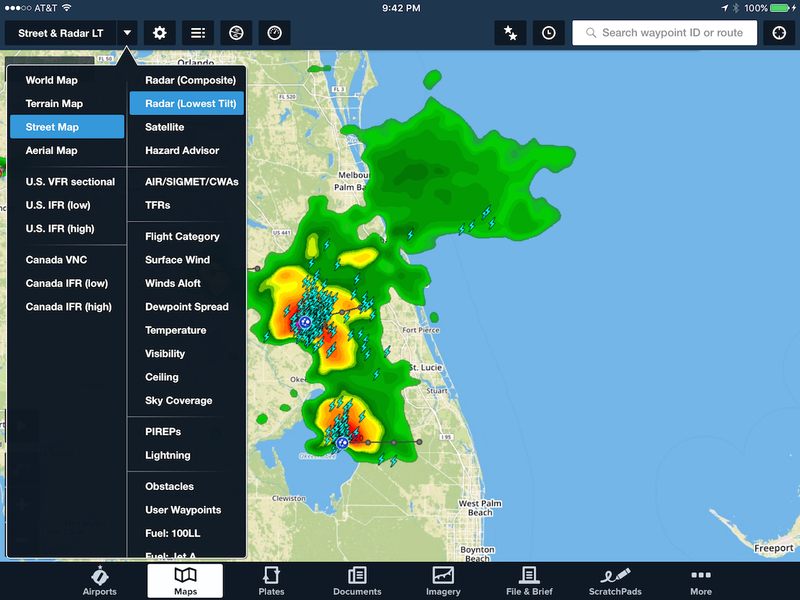 Finally, the Lightning layer no longer declutters groups of lightning strikes, allowing you to see all the strikes in a given area to get a better sense of where dangerous convection is occurring in a storm. 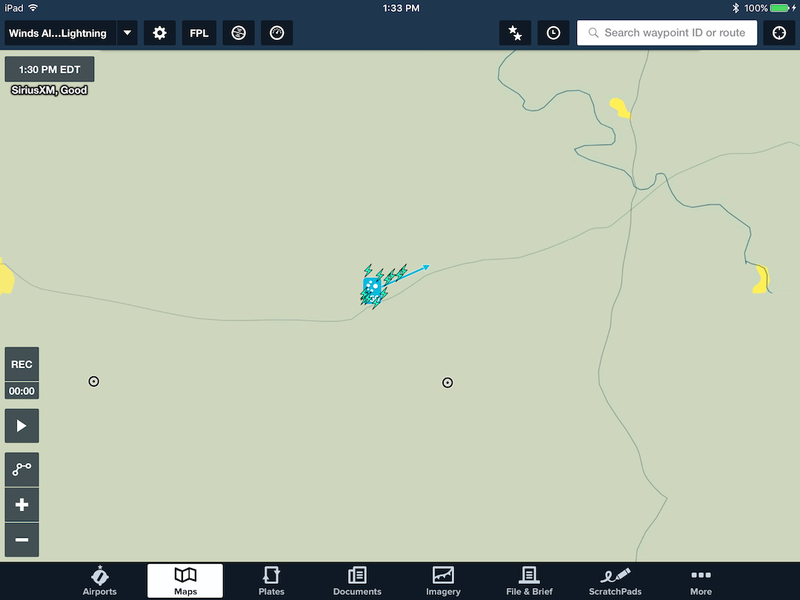 Also on the Maps view is a new option in the instrument panel: Descent to Dest. This instrument uses your GPS ground speed, GPS altitude, and distance to destination to compute the required rate of descent in feet per minute to be at your destination elevation upon arrival. The Descent to Dest instrument shows the rate of descent required to be at destination elevation upon arrival. 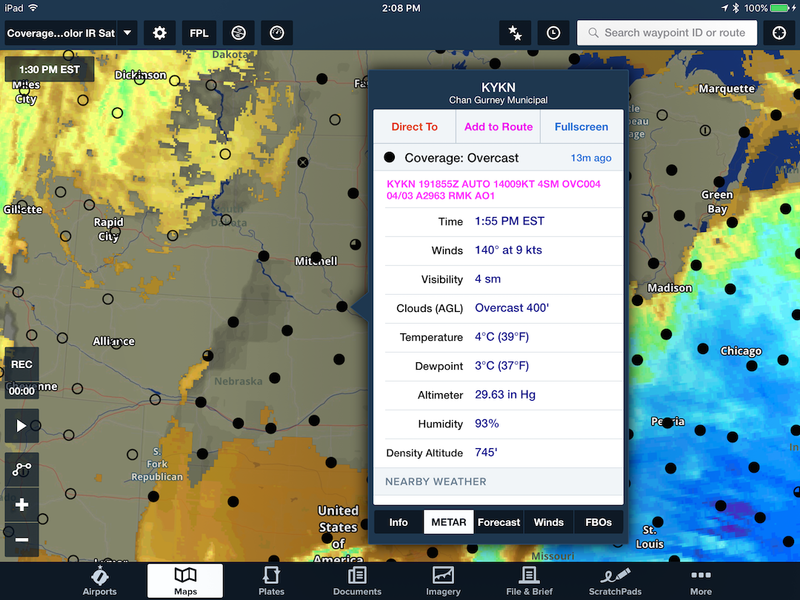 Military Flight Bag (or MFB), our dedicated subscription plan for military customers, now allows charts and data to be loaded onto an iPad over a wired computer connection — a process termed “sideloading”. While most of us have ready access to high-speed Wi-Fi and cellular connections, many of our military customers operate in areas of the world with slow or no internet – imagine trying to download a 2GB chart update over dial-up. Sideloading allows these updates to be delivered to multiple devices by connecting them to a central computer with the data already on it, giving military customers added flexibility in how they operate around the world. While not rare, it is a pleasant surprise to see a fairly quiet radar mosaic stretching from coast to coast. 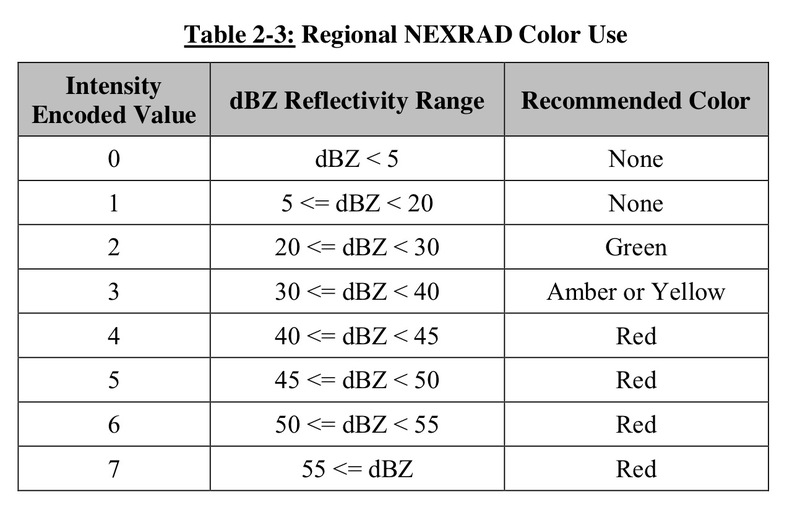 Unless you are specifically looking for nasty weather, a tranquil radar usually means decent flying weather, outside of cold clouds, in most locations that are not reporting low ceilings and reduced visibility due to a radiation fog event. 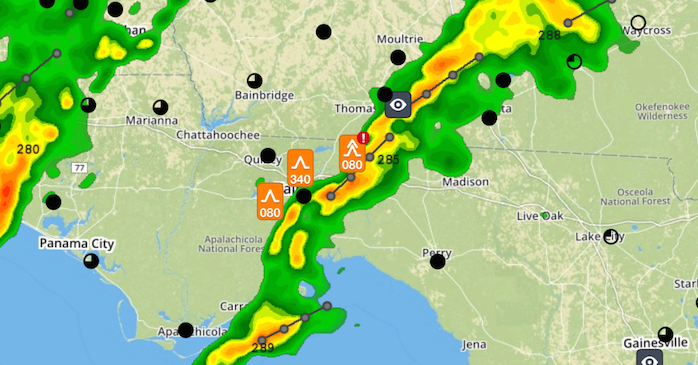 This also means you may not see some of the other familiar markers you’d normally expect to be displayed on the Map with the radar layer on. One of these markers that is often missing is the echo top heights. 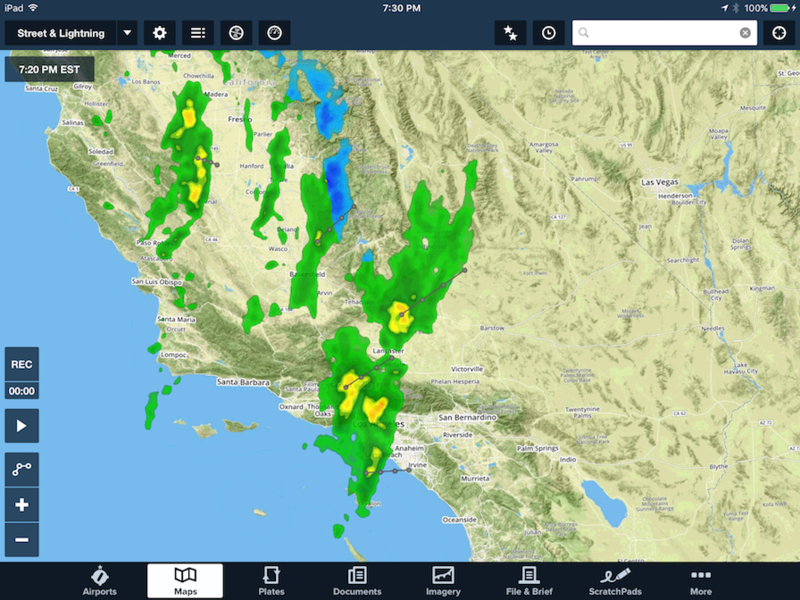 Overall, a fairly benign radar with the most significant returns in southern California. First, let’s get one thing out of the way; echo tops are not the same as cloud tops. Cloud tops are always higher. Second, echo tops represent the mean sea level (MSL) height of the highest radar echo of 18 dBZ or greater. 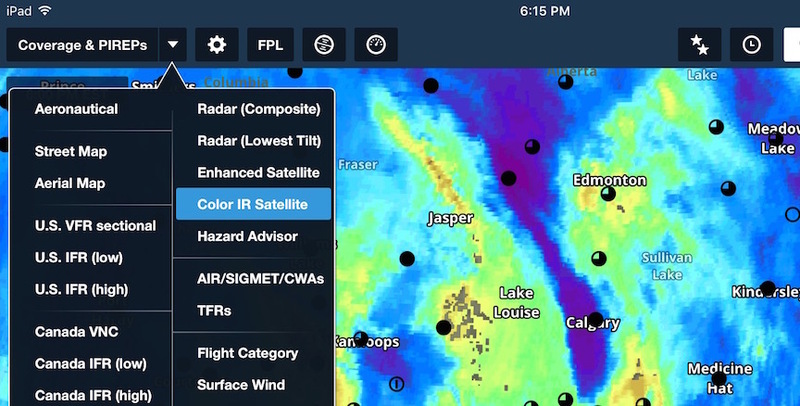 Third, echo tops heights are added to the NEXRAD mosaic in ForeFlight only when the echo tops consistently exceed 20,000 feet MSL. 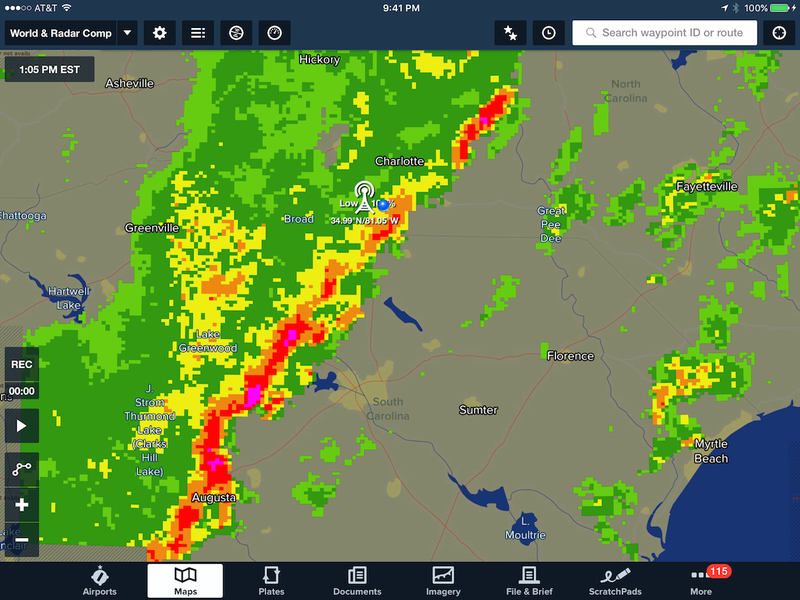 In other words, you won’t see an echo tops report of 15,000 feet, for example. 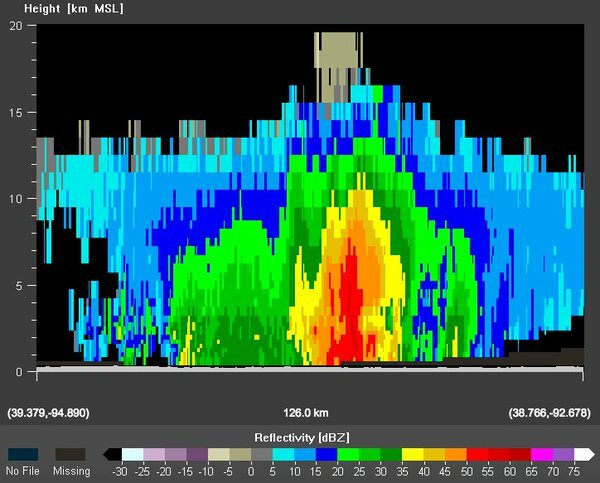 So it’s understandable for customers to believe echo tops may be “missing” from the radar mosaic when the radar is fairly benign. Moreover, there may be some intense-looking echoes in various locations, even some with storm tracks and mesoscale circulations shown, but no echo top heights anywhere to be found. Let’s take a look at a recent example. 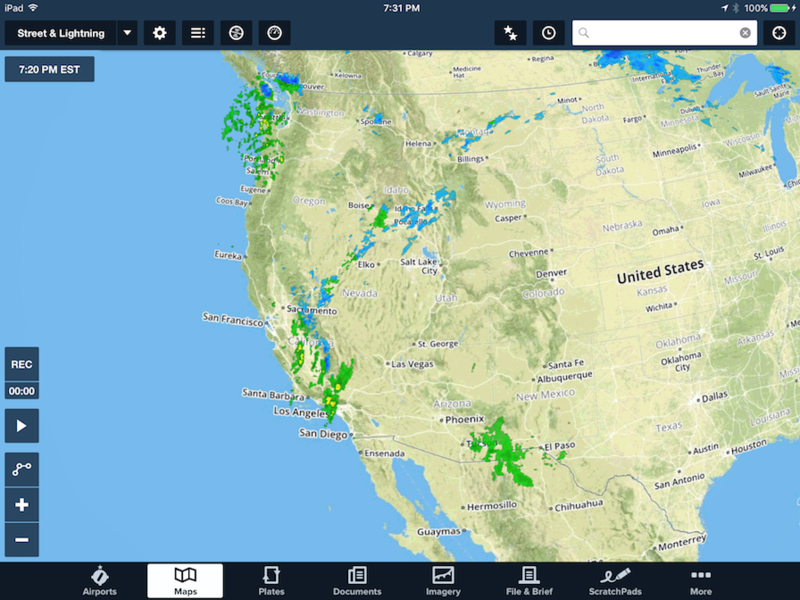 In the image above, notice that most of the U.S. is enjoying an early evening free of any significant weather. A few light echoes in southeast Arizona, some light snow in Montana and Idaho, showery precipitation in western Washington and probably the most intense area of weather in southern California. Zooming in on that area below, there are some areas with reflectivity values greater than 40 dBZ (yellow and orange) indicating moderate precipitation. But there’s not a single echo top height displayed even though there are several storm tracks identified. 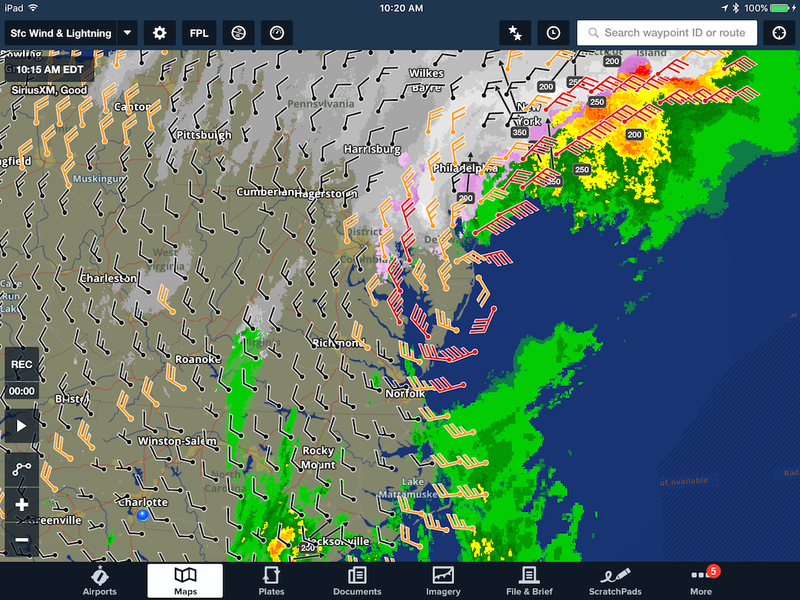 The storm tracks are there since the cellular structure and the relative high reflectivity of the echoes has triggered the NEXRAD algorithms to generate one. However, this algorithm is completely independent of the echo top height. 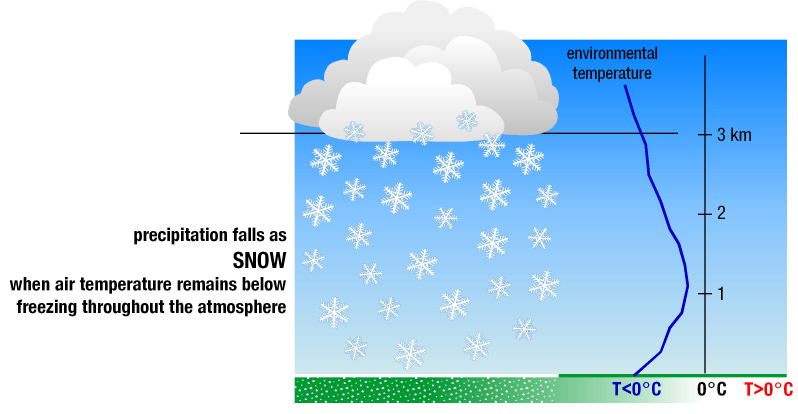 Cellular returns indicate showery precipitation. 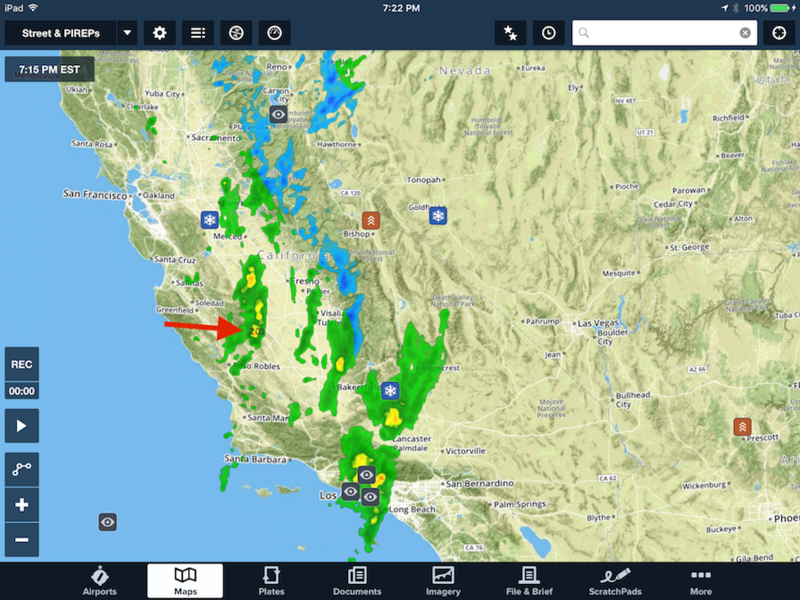 A few cells have storm tracks defined, but despite their intensity, no echo tops are shown. Despite the intensity of these cells in southern California, the echo top heights are likely below 20,000 feet. Since cloud tops are higher than echo tops, let’s examine the cloud top height in this area. 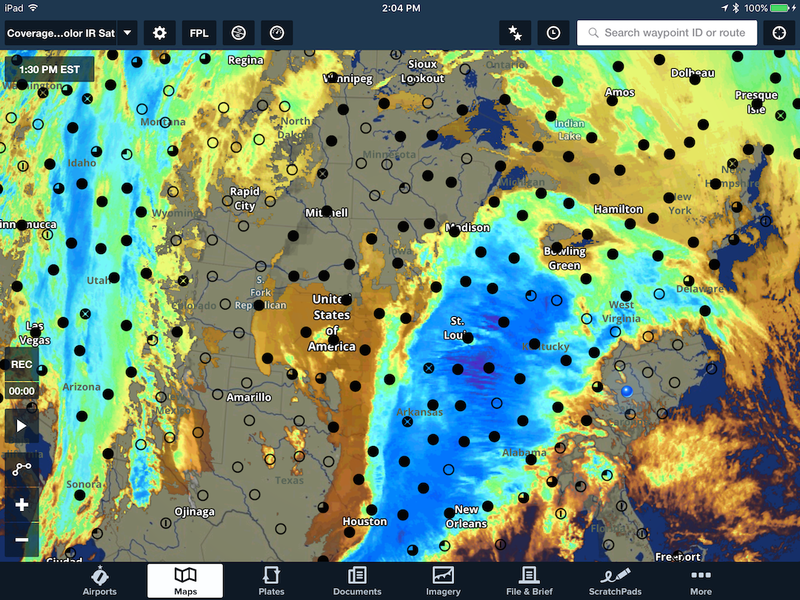 The best way to determine the height of cloud tops is to examine the satellite imagery in ForeFlight like the color-enhanced infrared satellite image shown below. This satellite image shows the cloud top temperature. Notice the pale green colors within the black circle where the most significant returns are located. Using the color bar at the top of the image, these solid pale green colors equate to a cloud top temperature of about -20 degrees Celsius. The color-enhanced infrared satellite image shows the temperature of the surface of the earth or temperature of the cloud tops. 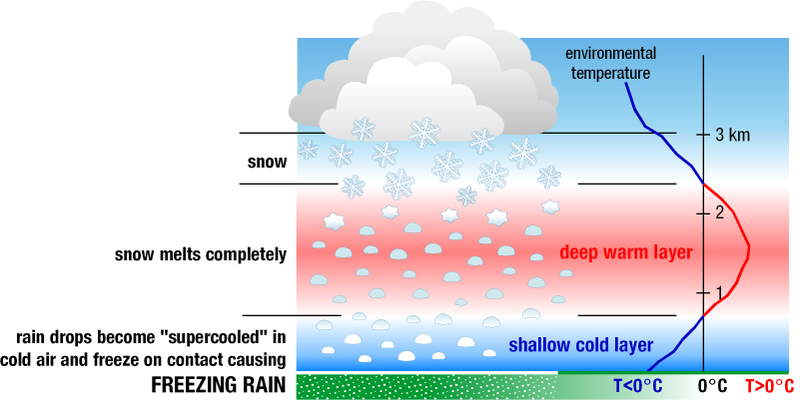 In this case, clouds in southern California have cloud top temperatures of -20 degrees Celsius. 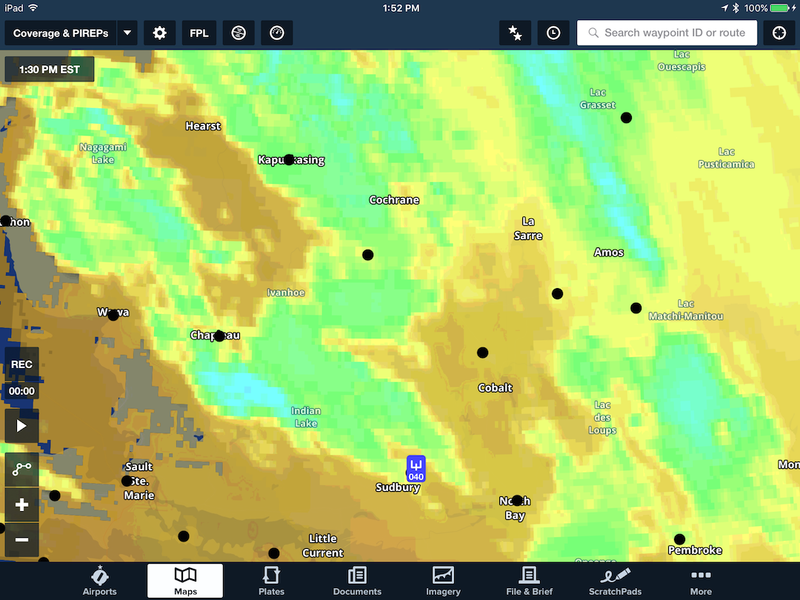 Once the cloud top temperatures are known, it’s a simple process to compare this cloud top temperature against the temperatures aloft using ForeFlight. 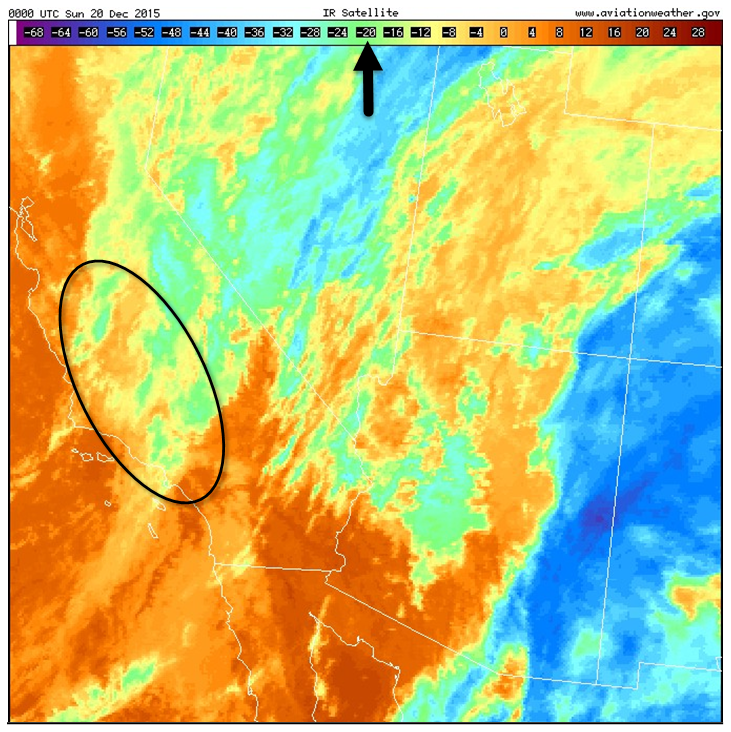 Below are the Winds and Temperatures aloft for Bakersfield near one of the more intense cells at this same time. This clearly shows at 18,000 feet MSL the temperatures were -6 degrees Fahrenheit or -21 degrees Celsius. So cloud tops in this region were definitely below 20,000 feet. 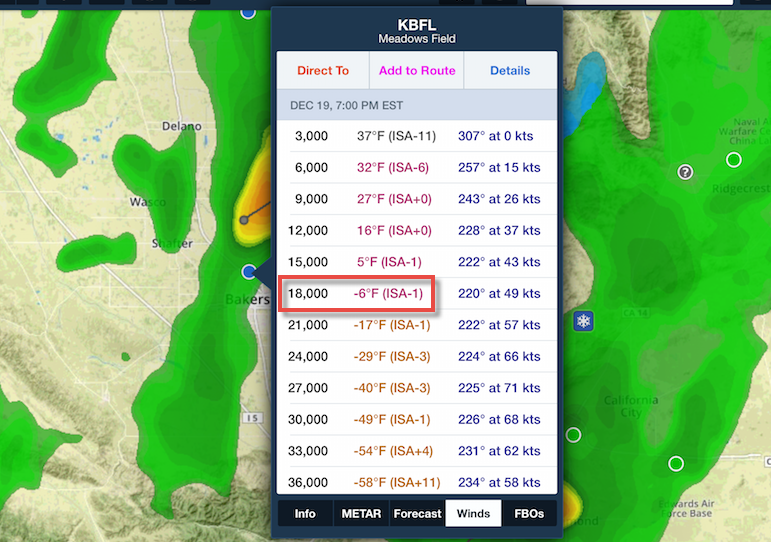 The ForeFlight Winds and Temperatures aloft show a temperature of -6 degrees Fahrenheit (-21 degrees Celsius) at 18,000 feet MSL over Bakersfield. 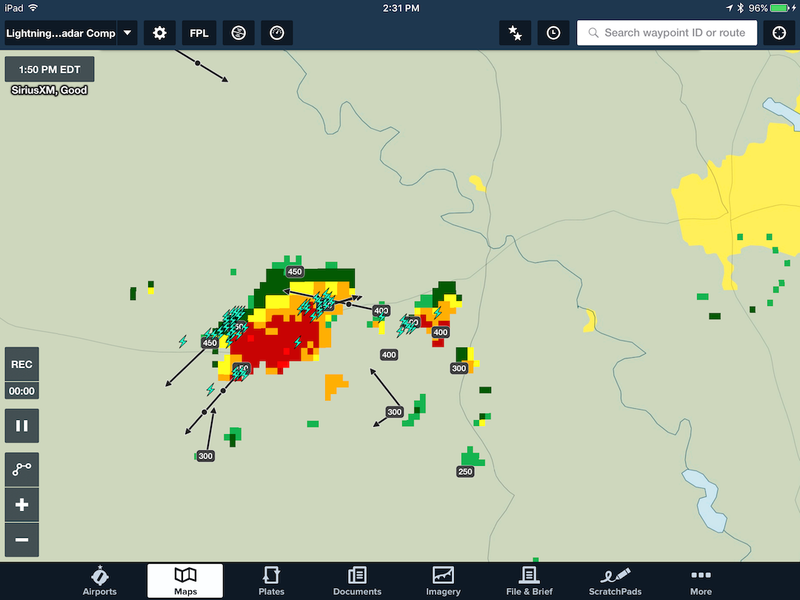 If you were paying close attention to the radar loop, you may have noticed that one lone echo top height marker appears (pointed to by the red arrow below) of 201 indicating an echo top height of 20,100 feet in this cell. 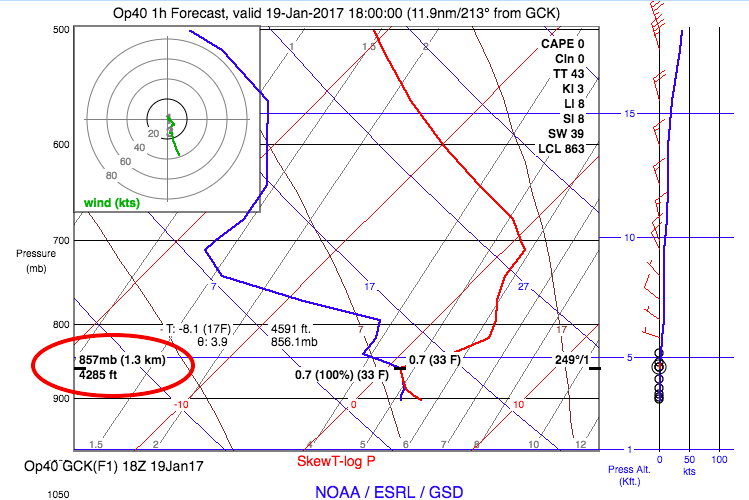 So when you see a lack of echo tops reported, it just may be that those tops are below 20,000 feet. A single echo top height of 20,100 feet MSL did pop up on the radar loop bolstering the idea that most echo tops were below 20,000 feet.